My four year old niece is staying with us right now as her parents get some much needed R&R. I'm so pleased to have another child in the house. I always did want four children. I don't anymore mind you, but still. She's been a fun addition. This morning I asked her if she wanted me to braid her hair. Sure, was her response. She was quite pleased about that. So, I had her dig through Finleigh's elastics to choose one that she wanted. 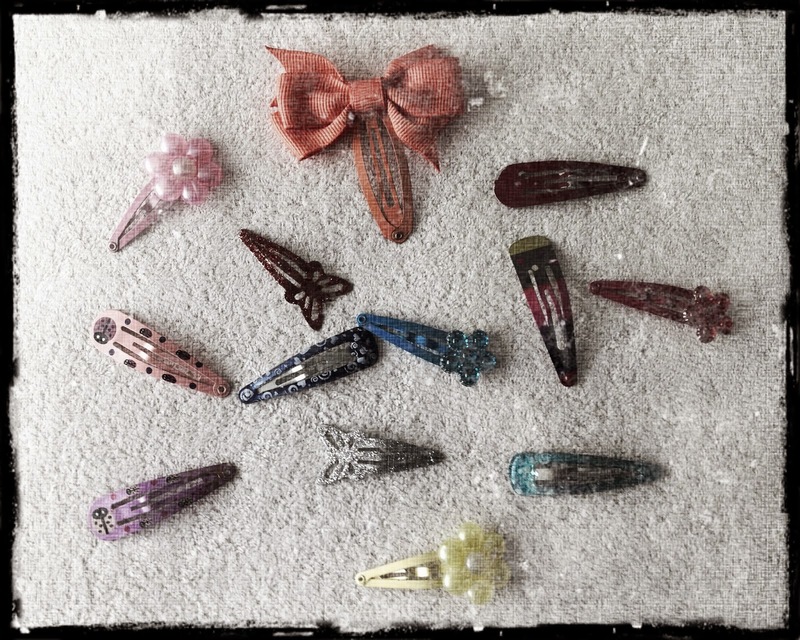 And then I dug out Finleigh's barrettes that I had bought back in my optimistic days. I have them hiding because Finleigh either chews on them, uses them as keys to get into locked doors, or takes them out of her hair after 5 minutes and loses them. We sat down, my niece and I, and I brushed her tangly hair. And she let me. The feeling I had was akin to the culture shock I experienced when I returned to North America after spending a summer in South-East Asia and I heard everyone around me speaking English again. She wasn't screaming. I didn't have to hold her down or wrap my legs around her. And when I asked her if it hurt, she said no and just sat there. Letting me brush her hair. I wasn't sure what to do with myself. I was in mild shock. So I braided her hair, put the sparkl, purple flower barrette in her hair, and she said thank you. Then Finleigh came bounding in, saw all the fancy barrettes and proceeded to put 4 of them willy-nilly in her hair. She let me put one in her hair, but brushing it was out of the question. I barely avoided a meltdown after picking up the brush. And now I sit here with just a little twinge of sadness. When her cousin who is three years younger than her shows more maturity than Finleigh or verbally expresses herself more effectively, I'm okay with it. I'm used to those deficits and I don't wonder "what if" anymore. I mean, Finleigh is who she is and I love her. She makes us laugh. She helps us see the world in a whole different way and for all my wailing and complaining, I wouldn't trade her for the world. Even if I have to settle for giving her haircuts that I don't really like because keeping it like that is the only way to avoid fights every morning. But the simple act of being able to comb long hair and put it in a cute little braid without engaging in a wresting match? Well, it was bittersweet for me today. I got to experience being the mom I would have been. It was just… so easy. And I know… not all girls cooperate when getting their hair done. I know that. But it was one of those things I had in my dreams for when I had a daughter. Us moms, we have hopes and dreams for our little girls when they're born. Inevitably they break out of our expectations to forge their own way - which is good. But when they're little, sometimes we're lucky enough to get to live those dreams for awhile. Mine was to have a daughter with pretty, long hair. Hair that I could comb. And braid. And curl. I had forgotten about that dream until I had that special moment this morning with my niece. I'm sure it meant absolutely nothing to her, but to me, it was a reminder of just how different my life really is than what I had hoped.